CROWHURST is a superbly acted, imaginatively visualised film about the tragic amateur sailor, Donald Crowhurst, who entered a round the world race in 1968, decided to cheat under enormous financial pressure, went made and committed suicide. We've actually had three films about this fascinating story of what happens to a normal decent man under profound pressure and isolation. The first was the award winning and compelling documentary DEEP WATER, which puts Crowhurst's story in the context of the wider race - and shows us that he was by far not the least prepared sailor and arguably only one of a number who suffered a mental break during the race. The second, was the fictionalised account of Crowhurst's story - THE MERCY - an altogether bigger budget and starrier affair, released earlier this year. But, despite being filmed by Oscar winning director James Marsh and starring Colin Firth and Rachel Weisz, THE MERCY was ultimately a disappointment. It felt flat - dull - there was little visual or storytelling imagination in portraying Crowhurst's descent into madness. And there was an absurd anti-media rant tacked on to the end that seemed to entirely miss the point of the story. The tragedy for the film under review today - CROWHURST - is that THE MERCY was released first and one wonders how many people would have the appetite for two films on the same topic. This was a deliberate strategy by the distributor of THE MERCY, which bought the rights to the competitor film and released it afterwards. 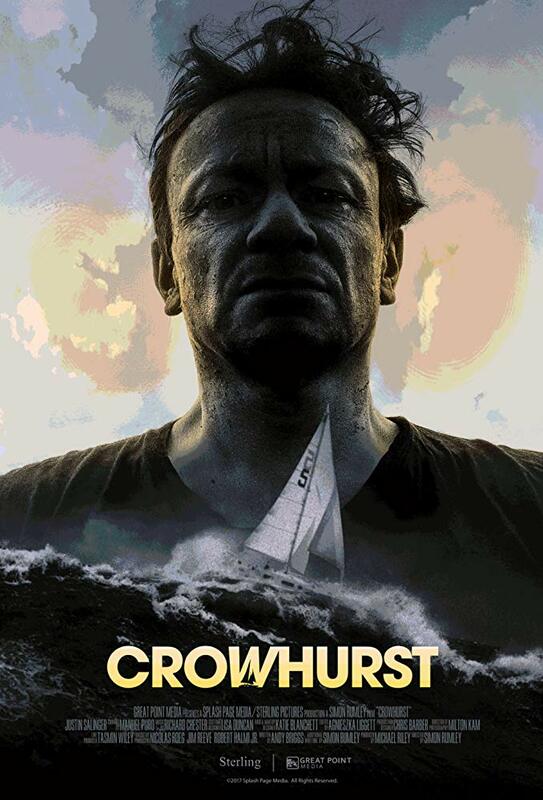 It's such a shame because CROWHURST deserves all the attention in the world - in fact, it's one of my films of the year! CROWHURST is directed and co-written by Simon Rumley - a low budget indie British director who seems to have a facility for horror and and a willingness to be visually and aurally daring in portraying inner psychological struggle. In this sense he is the perfect director for this story. He uses different colour treatments to give the impression of faded vintage footage - or of the bleakness of open water - or to show the disintegration of Crowhurst's sanity. He also uses split scenes, the manifestation of nightmares, rapidly speeds up film and cuts it aggressively. All to layer on the impression of a man unmoored from himself. Rumley is massively helped by his choice of actor for the role of Crowhurst - Justin Salinger. He may not be as well known as Colin Firth, but he's the right age, has the right look about him, and perfectly captures the shabby down-at-heel middle class decency of Crowhurst, and then in a series of increasing disturbing direct to camera insane ramblings - his mental breakdown. Rumley also benefits from filming in the actual house of the Crowhurst family, and through the use of music and swift editing and costume, evoking the house of a young couple, full of hope, but crushed by the financial failure of an invention that didn't sell. Rumley also - perfectly - begins and ends the film with Crowhurst choosing to take a loan from a businessman to fund the race - one that specifies that he will go bankrupt and lose that same family house if he doesn't complete it. This is crucial - because it's the financial trap that means he can't drop out and go home to his family. He has to finish. He knows he doesn't have the skill or the boat to finish. His only choice is death. The other aspect of this film that I thought was particularly impressive was the use of music - whether to show a happy couple dancing the twist - or a separated family singing Christmas carols - or the darkly tragic final scenes of a man who wants to be a latter day sailing hero singing the national anthem. This is also complemented by Richard Chester's score - at times austere, at times like something from a horror film, at times lyrical and tragic. Overall, CROWHURST is a film that shows what cinema can do best - take us into the mind of a man - using every tool in the box to evoke a specific moment in a compelling story. It is by far the superior film to THE MERCY and deserves to be seen. CROWHURST has a running time of 103 minutes and is available to rent and own.